Here is the first and last page of my Sketchbook Project 2012 Limited Edition book. 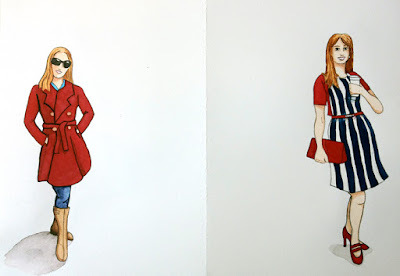 I painted what I wore each day, in 10 minutes or less, using watercolor and ink. My apologies for the image quality, since moving we haven't bought a new scanner or camera yet, so all of my photos are taken with my phone! 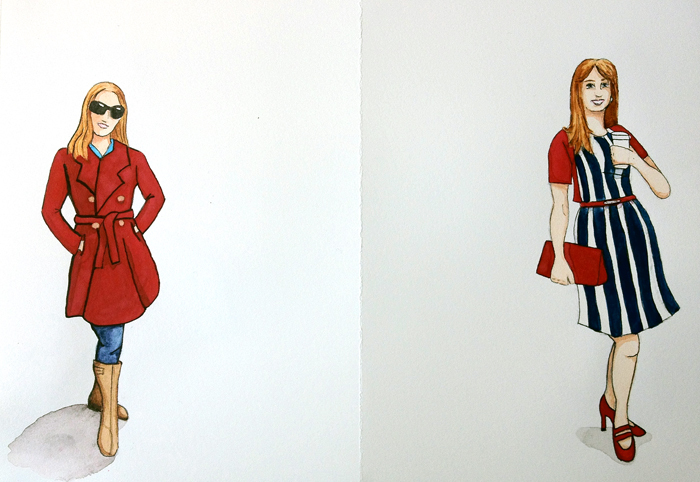 The image on the left is my new Marc Jacobs coat. The weather was cooler than we were expecting when we moved to San Diego, and we hadn't brought any coats with us! At least my NY boots are getting worn more than I thought they would. On the right is my favorite work dress, it is navy and cream with big pockets and a full skirt. Hello, I have just popped in from g+. This is an interesting and fun theme. I guess you must have some kind of thrilling moment while thinking of what you would wear next, I would be myself!.